Internet marketing, SEO services, web design, search engine optimization, link building, website promotion, pay per click & ppc. A premier website design company in Houston providing web design & development, SEO, social media marketing and mobile application development services. For custom interactive website design and development, turn to the expert team at Forthea, a company delivering professional websites designed to attract a targeted audience, perform well and promote brand. Integerz is a leading web development company offering various end-to-end e-consulting solutions. Our process greatly complements the challenging business scenarios of the ever growing industries. Some of the unique ideologies has set us apart from the other web designing and marketing firms. DESSS is an Web Design IT Services and Outsourcing Services Company in Houston, Texas. 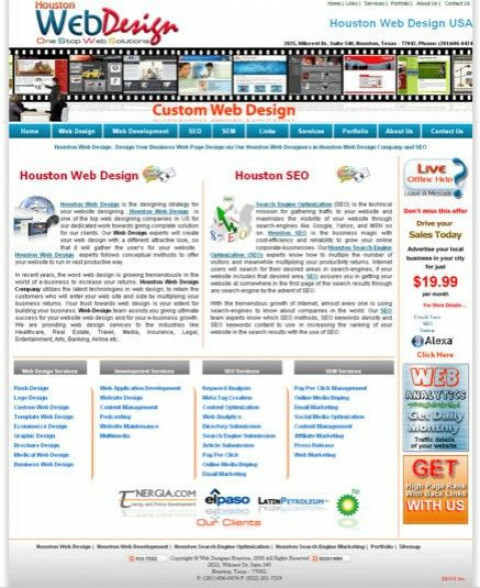 Houston web design, internet marketing and web development. Services include SEO, social networking, hosting, content management and website copywriting. Super Star Solutions is a creative web & graphic design company in Houston, Texas that produces unique results for online, print and multimedia. We provide marketing solutions with a focusing on websites and integrating internet related technologies. Melaroo offers web design, strategic internet marketing services, SEO services, social media marketing and video production. Concept Loft provides custom graphic design and web development solutions at a reasonable cost. We are flash based graphic designers who focus on quality concepts and unique ideas.